Will Sim soloing the lower section of the Freney Pillar at sunrise. The Freney is one of the most famous classics out in the Mont Blanc Massif. Regarded as one of the hardest ways to summit Mont Blanc in summer it was made famous by the fatal attempt of Bonatti and companions when 4 out of the 7 man team perished whilst retreating high off it during a lightening storm. Knowing the story well it was still hard to understand how they managed to retreat off the thing in such conditions and then navigate through such a perilous glacier, an ordeal that I’m not sure I could have dealt with. We fared better with stellar weather and a perfect sunrise, but alot of snow on the route. It had been a very wet summer and no one had been on the Pillar yet. I got soaking wet trying to climb a knife edge snow ridge ‘a cheval’ (rock shoes not ideal) and hit a major temperature low when the sun disappeared not long after. Thankfully we were high up on the Chandelle at that point but I can still remember how quickly I crashed being so cold, it was horrible. It was a good and fast one day ascent though and nice to have ticked it off without having to bivouac and climbing with day packs. 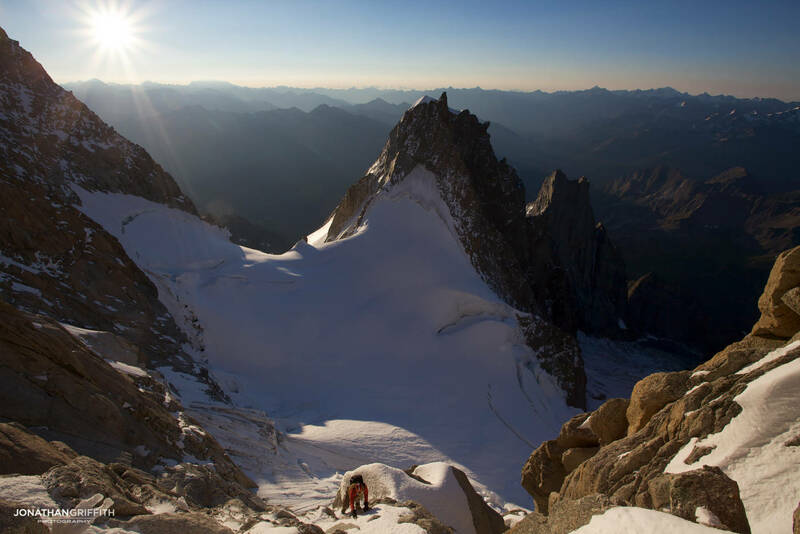 Any route on the South Side of Mont Blanc is always a major undertaking- it’s the remotest part of the Mont Blanc massif and the routes are big enough to feel expedition size. The bonus being that you get the bask in the rising sun and enjoy the incredible views that this steep granite face offers.